On Thursday, the head of the Hamas movement in the Gaza Strip, Yahya al-Sanwar, in a statement, said that the reporter who published an interview with him on the Israeli daily, Yedioth Ahronoth, introduced herself as an Italian journalist. Al-Sanwar’s office explained that the journalist had applied to meet the Hamas leader in Gaza with a formal request for two newspapers (one Italian and the other British). The office also confirmed that it had carried out investigations to make sure that the journalist was not Israeli and had no previous work with the Israeli press. “Unfortunately, the journalist did not respect her profession and apparently sold the meeting to Yedioth Ahronoth,” Al-Sanwar said. It is worth noting that the details of the meeting were published Thursday morning as a work for Yedioth Ahronoth. “We do not want a new war with Israel and we are not interested in it,” Sanwar told the reporter, saying that a new war does not serve the interest of anyone, and certainly not Hamas’s interest. Al-Sanwar added that Hamas’s goal was ending the blockade on Gaza, providing protection for it, and defending the right to freedom and independence. 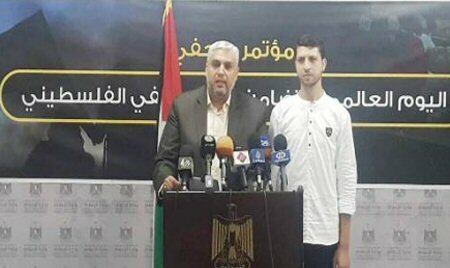 According to the PNN, Yedioth Ahronoth published excerpts of the interview, which was conducted by a journalist who visited Gaza for five days, where the most important thing in the interview is that the leader of Hamas, and its strong man in the Gaza Strip, clearly declares that he does not want a new war in Gaza, despite the escalation and ongoing confrontations on Borders of the Gaza Strip. Three Palestinians have been killed by Israeli fire and hundreds more have sustained injuries at anti-occupation rallies along the border between the besieged Gaza Strip and Israeli-occupied territories. On Friday evening, the Palestinian protesters threw rocks from behind clouds of black smoke of burning tires at Israeli troops, who responded with tear gas and live fire. 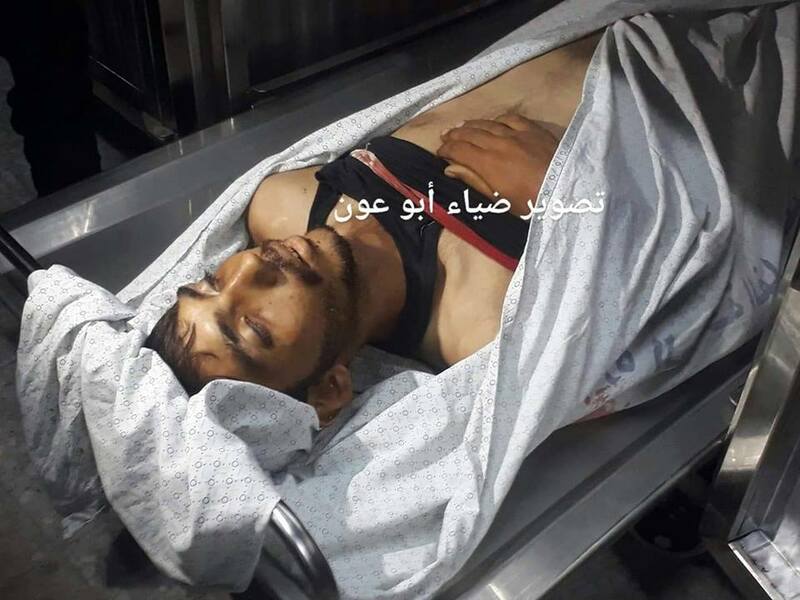 Abu Sama'an, 24, were fatally shot during “The Great March of Return” protests east of Gaza City. 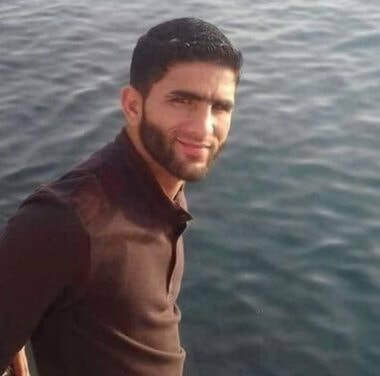 Hussein Fathi al-Raqab, 28, succumbed also to his Israeli-inflicted gunshot wounds at the Nasser Medical Complex. 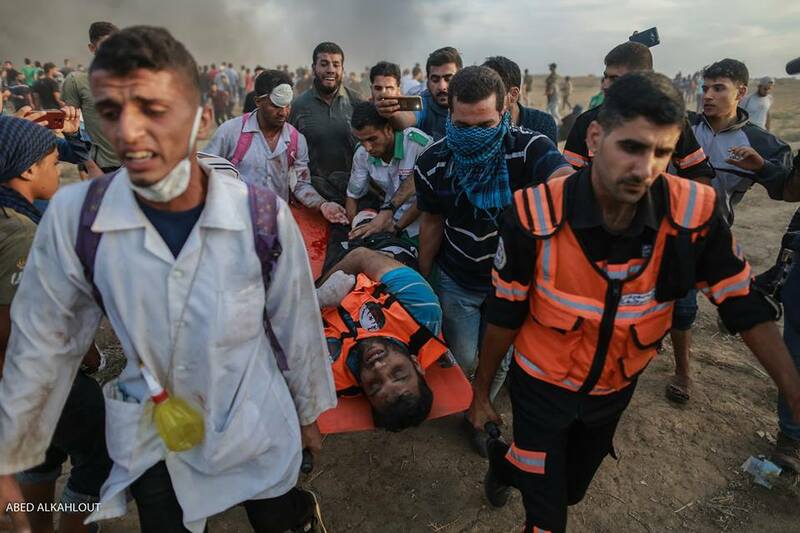 He had been shot and injured during a demonstrators east of the city of Khan Yunis, located about 25 kilometers south of Gaza City. The statement added that another 376 protesters were also injured. A total of 192 demonstrators were admitted to hospitals and medical centers across Gaza Strip to receive medical treatment. It further noted that 126 people were struck with live bullets. Seven wounded protesters are said to be in a critical condition in hospital. Qidra went on to say that Israeli military forces directly targeted a Palestinian ambulance with a gas grenade east of Gaza, without causing any casualties. Journalist Mohammed Hazem al-Masri suffered injuries when a tear gas canister hit him in the head east of Jabalia refugee camp. Nearly 200 Palestinians have been killed by Israeli forces ever since anti-occupation protest rallies began in the Gaza Strip on March 30. Over 21,600 Palestinians have also sustained injuries. A Palestinian child was killed, and a number of Palestinian citizens were injured when the Israeli occupation forces (IOF) violently quelled a peaceful demonstration near Beit Hanoun crossing, north of the Gaza Strip. 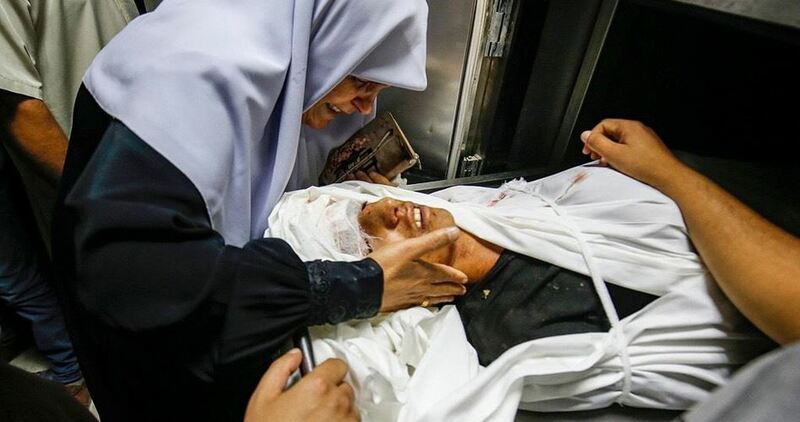 Gaza Ministry of Health said that Ahmad Abu Habel, 15, was killed after being shot in the head north of Gaza. A spokesman for the Ministry of Health said that 24 demonstrators suffered teargas inhalation and live bullet wounds. One of the injuries was described as "serious". According to the PIC reporter, medical and press crews were under attack too, and an ambulance was partially damaged after it was targeted with IOF fire. Since 30 March, Palestinians in the Gaza Strip have been protesting on almost a daily basis near the border between the coastal enclave and the 1948 occupied Palestinian territories. The protests, known as the Great March of Return, mainly call for lifting Gaza siege and allowing Palestinian refugees to return to their lands from which they were expelled in 1948. Israeli soldiers attacked, Monday, dozens of protesters at the northern entrance of the al-Biereh city, in the Ramallah and al-Biereh governorate in central West Bank, shot a journalist with a rubber-coated steel bullet, and caused many Palestinians to suffer the effects of teargas inhalation. The soldiers fired dozens of gas bombs, concussion grenades and rubber-coated steel bullets at the protesters, wounding photojournalist Shadi Hatem with a rubber-coated steel bullet in his leg, and causing dozens of Palestinians to suffer the effects of teargas inhalation. In related news, the soldiers shot three Palestinians with rubber-coated steel bullets, and caused many to suffer the effects of teargas inhalation, after the army resorted to the excessive use of force against protesters marching in Kufur Qaddoum town, east of the northern West Bank city of Qalqilia, against the Israeli legislation, and in solidarity with the families of al-Khan al-Ahmar facing displacement, and the demolition of their community. In occupied Jerusalem, the soldiers invaded the al-‘Ezariyya and Abu Dis towns, and attacked Palestinian protesters, wounding five with rubber-coated steel bullets and causing ten others to suffer the effects of teargas inhalation. The army also attacked protesters in Jabal al-Mokabber, in East Jerusalem. It is worth mentioning that Palestine witnessed a general strike in protest of the law, which ignores the basic rights of the indigenous Palestinian people, and states that the right to self-determination is only for the Jews, including instant citizenship rights to Jews immigrating to the country from several parts of the world, in addition to “reaffirming the status of unified Greater Jerusalem as the capital of Israel,” in addition to recognizing Hebrew as the sole official language of the country. The general strike was held in every part of Palestine, to emphasize the Palestinian unity and their rejection to the law which strips the native indigenous Palestinian people from their basic rights in their own land. Israeli soldiers abducted, on Thursday at dawn, five Palestinians from Qalandia refugee camp, north of occupied East Jerusalem, in addition to Qalqilia and Nablus, in northern West Bank, shot two journalists, and injured one Palestinian after ramming him with their jeep. Media sources said dozens of soldiers invaded Qalandia refugee camp, before storming and ransacking many homes, and occupied the rooftops of several buildings. They added that the soldiers abducted Mos’ab Hasan Sajdiyya, and his brother Ahmad, from their homes in the refugee camp. The soldiers also invaded homes in Qalqilia, in northern West Bank, and abducted Moath Ammawi, 21. Furthermore, the soldiers abducted Qais Hamadna and Amir Hamadna, from their homes in Asira al-Qibliyya town, north of Nablus. In related news, an Israeli military vehicle rammed a young Palestinian man, during protests against an invasion into Nablus, before he was rushed to Rafidia hospital. 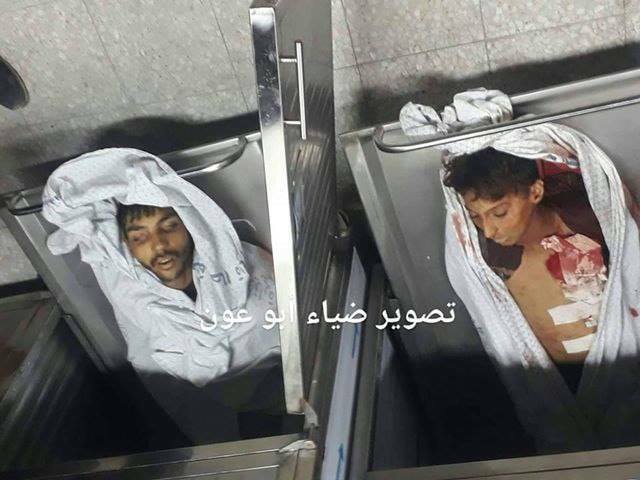 During the invasion, the soldiers shot two journalists, identified as Mahmoud Fawzi and Omar Esteitiyya, after directly targeting them while documenting the invasion. Israeli soldiers injured, on Wednesday at night, many Palestinians, including two journalists, during protests that took place in the northern West Bank city of Nablus. 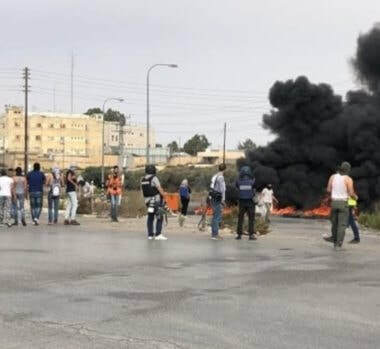 Dozens of soldiers accompanied colonialist settlers’ buses invaded Nablus, heading towards Joseph’s Tomb, while the army also closed many roads to block Palestinian traffic. The invasion was carried out by several armored military jeeps, and bulldozers. Many Palestinians hurled stones, and Molotov cocktails, at an armored military bulldozer, while the soldiers fired many live rounds, rubber-coated steel bullets and gas bombs. Medical sources said several Palestinians were shot, and dozens suffered the effects of teargas inhalation. 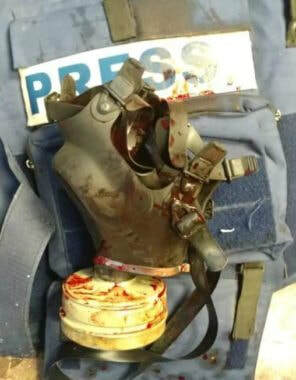 Among the wounded are two journalists, identified as Mohammad Fawzi and Omar Esteitiyya. The Government Media Office (GMO) held a press conference on the occasion of the International Day of Solidarity with Palestinian Journalists, which coincides the 26, September, each year, demanding to practically show support for Palestinian journalists. The head of the GMO, Salma Ma’rouf, praised efforts of the Palestinian journalists who continue conveying the truth despite all dangerous aggression of Israeli occupation, against them. In the press statement, the GMO pointed out that the Israeli occupation has adopted a systematic policy of targeting Palestinian journalists, ignoring all international laws and norms that guarantee freedom of speech. Since the beginning of this year, Israeli forces have committed 633 violations against Palestinian journalists, the latest being the targeting of journalists who were covering the non-violent peaceful Great Return March on the eastern borders of the Gaza Strip. Two were killed and more than 180 were injured. Violations against journalists take many other forms, according to Al Ray Palestinian Media Agency, especially in the occupied West Bank, including the denial of access to locations, destruction of equipment, arbitrary arrest, physical assault, and use of firearms that lead to injury or death. Israeli forces not only target journalists in the field, but also hinders their work through the intentional disruption of broadcast signals, frequent shutdown of radio stations, and occasional destruction of media offices and broadcasting towers. 21 journalists are still being held in Israeli jails. – Calling on Palestinian journalists to save no effort on revealing Israeli crimes and aggressions against Palestinian people in the West Bank and Gaza Strip. – Calling on all international and regional institutions and organizations to stand by Palestinian journalists against Israeli violations, translate their support to real actions on the ground and to cancel the membership of Israel from all forums that defending the freedom of opinion, especially the International Federation of Journalists. – Warning of the overwhelming silence regarding the Israeli violations against Palestinian journalists, stressing the importance to try Israeli leaders over their violations of journalists’ rights. – Calling on international institutions to exert pressure on Israeli occupation to allow the entry of protective equipment for journalists such as press vests, helmets, gas masks and other means that Israeli occupation has banned its entry to Gaza for 11 years. – Stressing the Palestinian journalists’ rights to work within the recognized law, values and ethics and in accordance with the social and national responsibility that protects them. – Stressing the importance of unity to face the internal division through re-activating the journalists’ union according to free and fair elections that all journalists have the right to participate in under the syndicate and democratic applicable norms. Israel’s Ofer military court confirmed a six-month administrative prison-term, issued with neither charge nor trial, against the Palestinian journalist Mohamed Mona. The journalist’s father said the family’s attorney updated them on an Israeli verdict to have Mohamed Mona, working as a correspondent for Quds Press and serving as the head of Hawa Radio Station in Nablus, to serve a six-month administrative sentence in Israeli dungeons. Journalist Mohamed Mona was kidnapped by the Israeli occupation forces last month and sentenced administratively without trial. 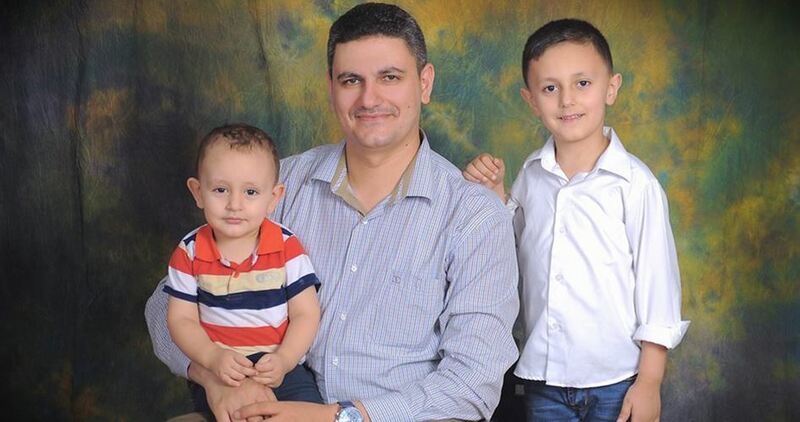 In one of his earlier arrests by the occupation forces, the journalist had undergone an open-ended hunger strike to protest his arbitrary detention.